1. Mix all the ingredients in a bowl to a poori consistency. 2. Make small balls of the mixture and roll them into small circles. 3. Fry them in hot oil till golden and remove. 4. Drain excess oil and serve. 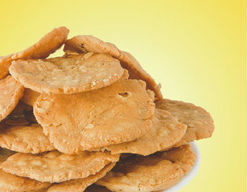 Feel free to comment or share your thoughts on this Namkeen Puri Recipe from Awesome Cuisine.